Cheap Points for the New Le Meridien Rome! We Just Booked the New Le Meridien Rome for Only 11K SPG Points Per Night! I’m getting super excited about our 2017 spring trip to Europe. The only thing booked so far is our one-way flight on Iberia in business class (for 50k Avios) and our hotel in Rome for 5 nights…the brand new Le Meridien Visconte, an SPG property. Le Meridien–A Fantastic Redemption Value for Rome, Only 11,000 per Night! The hotel isn’t even open for business until February 2017 but the artist renderings look fantastic and the location is excellent, near Vatican City. We are using 11,000 SPG points per night and taking advantage of the 5th night free benefit, so the entire 5-night stay is only 44,000. The cash price is $272 Euros per night. Initially we were only going to spend two nights in Rome but with this redemption we decided to extend our visit. The next lowest SPG redemption is 22,000 points or 281 Euros per night. That’s why the Le Meridien is such a deal! Let me give you a comparison of the value of this redemption in Rome. Recently SPG merged with Marriott so we can also stay at a Marriott using SPG points. One SPG point equals 3 Marriott points. The cheapest Marriott hotel in central Rome is 45,000 per night plus 80 Euros per night. Even though Marriott also offers the 5th night free, we will be saving 4000 SPG points and 510 Euros by staying at Le Meridien. If using money to pay for these hotels, Le Meridien is 272 Euros per night and the Marriott is 391 Euros per night. Of course, if we had to pay money, we wouldn’t be staying at either of these! There are plenty of Airbnb choices for about $100-120 per night, and small hotels and pensions for $80-120 per night but since we are on a 3-week trip, we are saving as much cash as possible for cities that don’t have options to use points. To those of you who really love luxury, the St. Regis in Rome is only 20,000 points but it’s under construction until mid 2017. For us, the points difference is not worth staying here. When I looked for a hotel on the SPG website at first glance all the options were too many points for my liking. 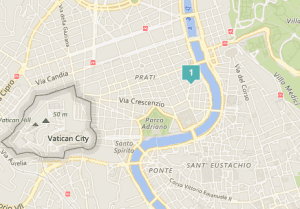 The lowest point value in central Rome is 20,000 per night and goes up to 30,000. There was no point value listed for the Le Meridien but I noticed a small box that said to call SPG directly for more information. I called but was expecting to hear that it would be 20,000 per night, so I was thrilled to learn it’s only 11,000! There is a $1 fee per night for something but I don’t remember what. I was afraid to ask too many questions because maybe she would discover that the point rate was incorrect. The point rate is correct and I’m so glad I called!